BizMobile Go! is a cloud-based MDM service that enables easy, remote, and central management of business devices. Packaged with the world first “Template Function” and the “Virtual Device Synchronization Function”, BizMobile Go! drastically reduces and simplifies many of IT managers’ tasks: Initial configuration and change of configuration, installation of new features, and daily monitoring of usage. 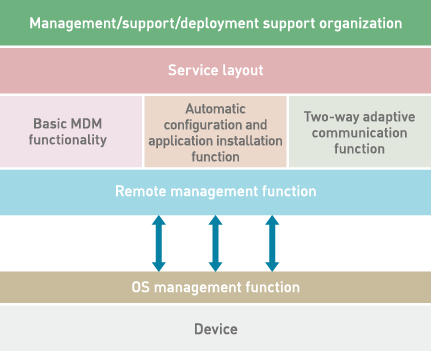 As the only MDM in Japan capable of handling tens of thousands of devices simultaneously, it has been implemented in 70% of all listed companies. BizMobile Go! supports all 3 mobile operating systems widely used in the mobile device industry. BizMobile Go! outperforms in 8 aspects, which allow it to have high-quality features as an MDM, be user-friendly to end users, and drastically reduce expenses related to mobile device management. Click here for more details on the key features. We continue to improve BizMobile Go! based on user feedback and deliver an MDM system based on the needs of the different departments within the enterprises. BizMobile Go! provides automatic configuration and application installation features and two-way adaptive communication management function. It can perform forced installation and forced restrictions according to the status of the device. BizMobile Go! has extensive track record, ranging from small-scale business to large-scale implementation of an MDM system with 75,000 devices.